What’s Next for Rapid Redux? The five year-old gelding Rapid Redux tied the North American record of 19 consecutive victories. Rapid Redux now shares that record with 2010 Horse of the Year Zenyatta and the retired New Mexico-bred Peppers Pride. Everyone knows Zenyatta’s fame and how she won the first 19 races of her career and lost only once as she tried to win consecutive Breeders’ Cup Classics. The mare Peppers Pride ran only in New Mexico state-bred races and never lost a race in her career. 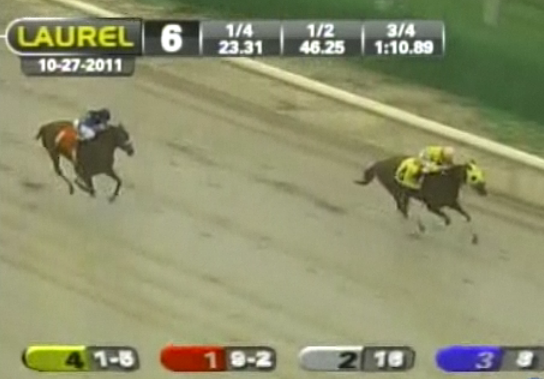 Rapid Redux took 10 months and 25 days to win 19 in a row. Zenyatta needed 2 years, 11 months, and 10 days to get to 19 victories. Peppers Pride reached the 19 wins in 3 years, 4 months, and 29 days. Of Zenyatta’s 19 victories 17 came in grade one or grade two stakes and she earned $7,304,580 in her career. Peppers Pride won 14 state-bred stakes races and $1,066,085. Rapid Redux ran in the Tyro at Monmouth Park as a two year-old and the Long Brach at three and he finished last in both. He has career earnings of $332,544. Rapid Redux toils in racing’s claiming ranks having been taken for $6,250 by current owner Robert Cole. Turned over to trainer David Wells he has gone on to win 19 of 20 starts for them. That is the life of the claiming horse. Rapid Redux has run for three other trainers in his career. In his winning streak he has won with 5, 8, 9, 10, and 13 days between some of his races. The most rest between races was a little over a month. His 19th consecutive win came on a muddy sealed track at Laurel, which is one of seven different tracks at which he has run. Rapid Redux ran the seven furlongs in 1:24.07, which is one of seven different distances at which he has run. Since her retirement Peppers Pride has been bred to the fashionable stallions Tiznow and Distorted Humor at WinStar Farm in Kentucky. Zenyatta now lives at Lane’s End Farm and is in foal to Bernardini. So where does Rapid Redux go after his racing days are over? Cole seems to be thinking about that, “I’d love to break the record and have the Kentucky Horse Park invite him there to retire.” Sounds like a great plan! This entry was posted in Monmouth Park, Rapid Redux. Bookmark the permalink.